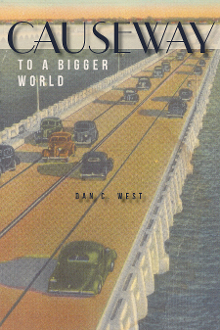 Born in Galveston, Texas, in 1939, Dan West moved with his family from there to Houston in 1949; he was 9. They drove out of Galveston on the causeway that links Galveston Island to the mainland. It was the beginning of an odyssey spanning six decades. This book, West’s memoir, describes the ever-widening circle of experiences, education, relationships and perspectives that followed. Education occurred in four colleges and three graduate schools. There were frequent moves to nineteen different cities in various parts of the U.S. Work history comprised a small church, five colleges and several consultancies. West’s career combined two professions: the ministry and higher education administration. Extensive worldwide travel happened over 50 years. All of it helped form the mosaic of a varied, often intense life experience. Is it better to spend all of one’s life in one’s birthplace? Or, does one benefit more from many moves and living in many places? What can be said about West’s effort to bridge church and academy? What patterns emerge as an author tries to read into his life story the meaning of events and directions, from the vantage of hindsight? What imprint has this life had on others, along the way, and what has been the imprint of others on him? This is a biography of surprising turns and some false starts. It is a journey too surprising to be made up.